Am I doing this right? This can’t be right. This doesn’t feel right. This definitely doesn’t look like what that girl is doing. The teacher said to ask for help, but I can’t do that. Everyone will hear me asking for help. They’ll know I have NO clue what I’m doing. Sigh…I hate half pigeon. Some yoga poses can be very daunting for yoga practitioners of every level, but especially for beginners. Half pigeon, in my experience, is one of those poses. 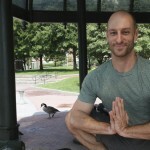 From the very first time that it was cued in a class I was in, half pigeon became my nemesis pose and, ultimately, the asana that has taught me the most “yoga”. Why am I putting yoga in quotes? Because the physical posture of half pigeon was the gateway for me to learn the lessons of self-compassion, acceptance, working from where YOU are and the simple power of breath. In theory, once you know the body alignment of a pose and get your body into the alignment that best matches (every body is different), then that should be it. You should hold the pose, breathe and move on. Take a moment to think about that – if your mind wasn’t involved in your yoga poses, your body would JUST do the pose and be content. It’s your mind that creates struggle in a pose, from comparison to judgment, self doubt to disappointment, these all come from your mind! My mind made half pigeon an extremely hard pose. As a beginner, it took me a little while to learn the poses and the sequence, but soon enough I knew exactly when HP was coming and started to feel hesitant, anxious, frustrated and angry – I hate this pose! Well, wait a second, why don’t you roll onto your back and take reclined pigeon? The teacher is offering that as an alternative, maybe that will feel better. Umm…no…that’s a pose for people who can’t do HP and I don’t want the other people in the class to think I’m bad at yoga (because everyone is busy in their practice watching me, right?). Hence the epic battle of my mind vs. my body in HP continued. As my practice evolved I would talk to people about how much I didn’t like half pigeon. To my shock, awe and frustration a lot of other practitioners loved HP. What?!?! Are you serious? Now, not only do I have my struggle, but now the knowledge that other people love this pose. This makes me feel even worse. At this point I become convinced that there is something wrong with me. Why don’t I like this pose? Let’s see, I never feel like I’m in it correctly. My hip is lifted so high off of the ground it’s embarrassing. Everyone else has their hip on their mat. My body must be made wrong. It has to be that. I have always been good to superior at anything athletic. Why can’t I do this friggin’ pose! Ahhhh! This same struggle and script continued for about four years – 4 years! Some days were better than others, but for the most part practicing half pigeon was a consistently unpleasant experience. It wasn’t just that I would get into HP and grumble, I tried to be nicer to myself, I tried to accept where I was, I tried to let it be ok, I tried. One day during practice, I came into half pigeon on the right side. I took time getting into my correct alignment and as I was bringing my body down towards the mat, I sunk into a really satisfying stretch. As I was enjoying the stretch (I think there was even a smile on my face) it hit me! This stretch, this satisfying, sensuous stretch, is only possible because my hip is lifted. If I was in HP the way that I thought I should be with my hip on the mat, I wouldn’t be feeling this glorious ripple of sensation! In that moment my faith in the practice was rewarded. My entire struggle culminated with the realization that I was exactly where I needed to be and my body was exactly as it should be. That definitely brought a smile to my face and a warmth into my body. It was as if that thought, that realization, was giving me a hug and I was home in pigeon. I flirted with yoga for a long time. I really, really, liked her, but I was scared. I was scared that when yoga got to know me, she wouldn’t like me. I was scared that she would judge me for all of my faults and imperfections. I was scared that when yoga saw the real me, she would reject me and look down upon me, but the more I got to know yoga, the more at ease I felt. Yoga was kind and compassionate. She accepted me for me even knowing all of my faults, which see didn’t even see as such. She had compassion for me and taught me to have the same for myself. Yoga loved me and showed me that I am perfect as I am, just as everyone is perfect exactly as they are. Now, yoga and I are in a committed relationship and I couldn’t be happier. I love taking her everywhere with me and introducing her to everyone I meet. And I am truly happy, because I know that yoga will be with me, always. 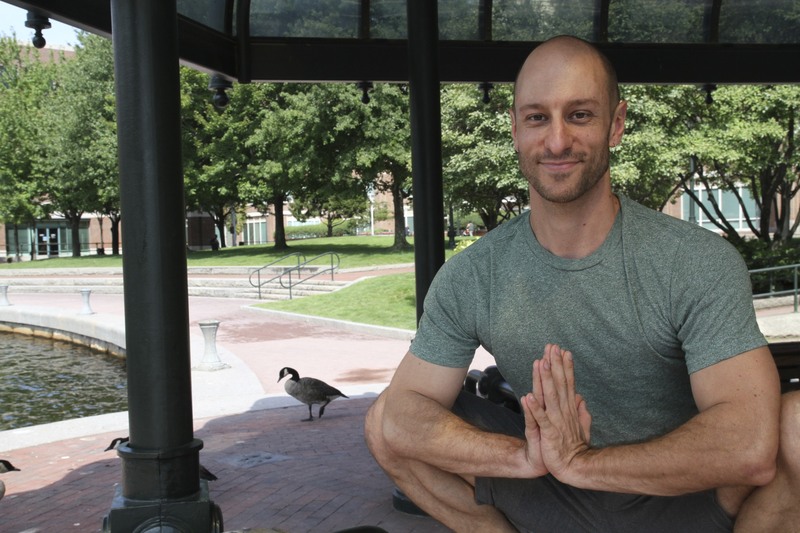 Tony is based out of Boston, Massachusetts and teaches at various Prana Power Yoga studio locations. For more information or to learn more about Tony, go here.